Given that we don't have a Forum regarding this, I'll post in HVII. I wanted to share this post I made at HC to see what you guys think of the subject. The idea that I was thinking months ago around this can be see more or less in THIS THREAD., and a bit resumed described in my post in this PART. Also a bit of talking around AMMO CART functions would gravitate around that conception. The list has no particular order. It is only a collection of features noted as to describe the project. 7 Resources: gold, wood, ore, crystal, gem, sulfur and mercury. Population limit and upkeep. Population limit dictates the maximum size of troops. Heroes can build structures on the Adventure Map. Towns can be converted at certain point, with high costs and time consumption. Limitations on dwellings and special buildings on converted towns are applied and towns which are exactly of an opposing faction cannot be converted, only destroyed or else very poorly availed. A Town grants control over an area and any other areas linked to it when they are fully explored (A Fort grants control of only the area they are built on, and a garrison protects the borders or accesses of controlled areas). Flagging control structures, Towns and Forts, of an area will trigger a corresponding number of days (based on default movement) to flag secondary structures, and only if they are not guarded and were, at least once, already visited. Each area has its own perks on maintenance (upkeep) which relates with local production, happiness, logistics, loyalty, scouting, pathfinding and whatnot. Tactics skill allows different settings/formations of single stacks of troops, combination of different troops and different settings for the whole army. Might Heroes classified as Commanders are better suited for Tactics strategies. There are terrain and weather elements influencing battle and adventure spells/skills. Battle maps are also irregular, with different heights, obstacles, sizes, layouts and interactive elements, either on the map or influenced by external forces. 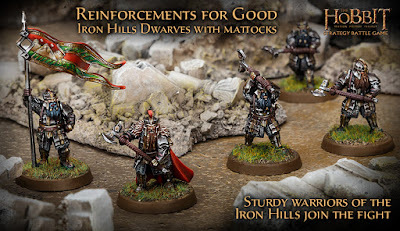 Heroes on battlefield influence troops depending on their positioning, given they have an Area of Command (AoC). They can accompany troops for physical boosts, morale, can also channel and cast spells from afar. And keeping an army nearby guarantees their safety against direct engagement against enemy troops or enemy heroes. 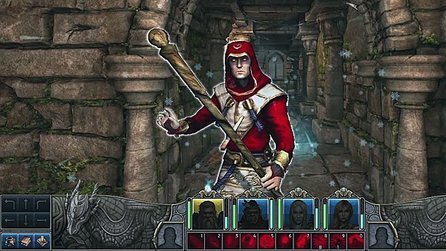 When engaged without any defensive army, they’ll have a first-person duel as in Might and Magic game, fighting against enemies which level is based on the number of the stack and, if the enemy chooses, their hero will also join the fray as well. The level of engagement in battle varies from hero to hero depending on their classification. Might and Magic Commanders have greater influence and presence on the battlefield. Explorers have presence preceding a battle and after the battle. Rulers have remote control over the battle with the assignment of commanders. Spells are universal; they are pure results of the creation of all things. Some schools and guilds of magic transforms the nature of spells into their own means, making spells acquire different perks depending on the faction, still keeping their base utility, even when its nature is tweaked. 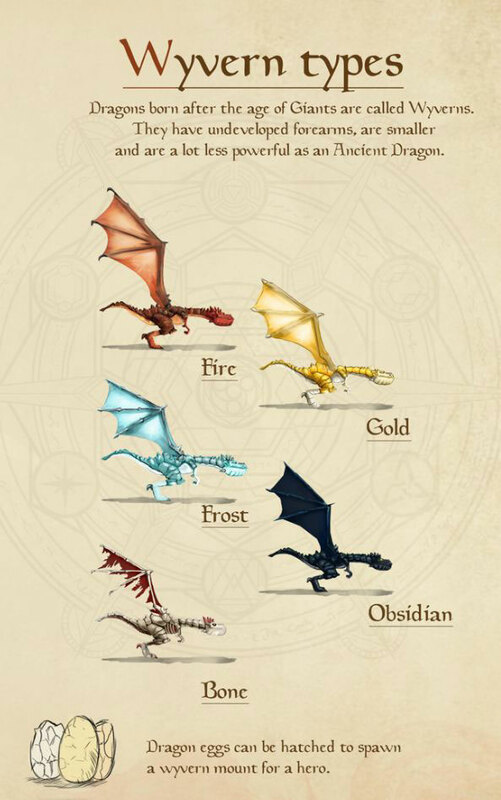 Each faction has a selection of hirable units, but they are not all available at the same time. Some choices must be taken when developing a town. Besides, only a selection of all units in the game has upgrades. Whilst some others may have equipment and technologies to be researched. Stacks of units have limit of numbers. As they increase in numbers they can spread on more than 1 hex of size, in even numbers (however, some Tactics Skill perks can change these settings). This way, when troops engage each other whilst just a part of their armies are in contact, only part of the army will effectively interact. Commanders abilities may influence the max size of units in each hex, max number of hexes a unit stack can spread about and other settings. Advanced Posts or Camps can be settled on uncontrolled/unexplored areas, granting the ability to supply troops and keep flagged buildings under control even on areas controlled by the enemy, forcing them to come reconquer these buildings or attack that Post. Resting at camps also doubles effects of recovery and healing. Only one advanced camp is allowed per area of control and only if there is no other allied Fort or Town nearby. They can be evolved into an advanced fort, then a keep. Heroes have unique skill-trees, specialties, perks and abilities; and the random aspect is based on proficiency of the hero. There is a custom-hero alternative which allows creating a special evolution tree. There are three distinct groups of heroes: Commanders (which are better suited for battles; they also have greater AoC on the battlefield), Explorers (better suited for exploration of maps, logistics, finding dungeons, building advanced posts, expanding borders) and Governors (better suited for building and evolving towns, developing the kingdom’s economy and dealing with diplomacy and all areas of control welfare). And each group have Might heroes and Magic heroes. Spell casting in battle, when done by heroes alone, affect a group, an area or an enemy hero, but effects depend mainly on hero spell power. However, when the hero is casting spell and there’s a stack allied units who are spell casters and they have that same spell in their spell book, they can actually imbue a collective spell casting, strengthening greatly the hero spell casting. A hero can also augment a school of magic arts upon spells known by troops, changing their nature. Necromaturgy revives the fallen as zombies of their own kin. It only works on living creatures with physical bodies. 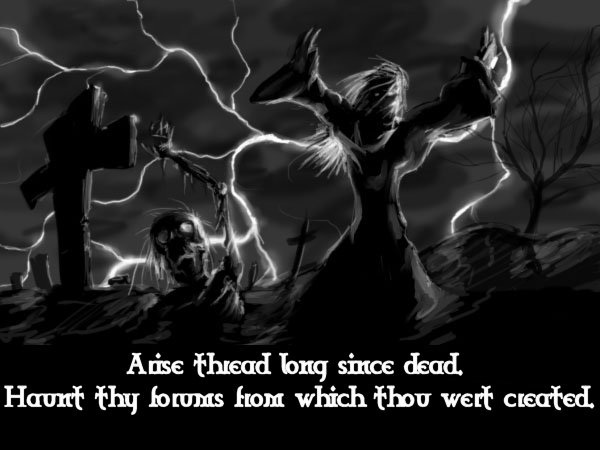 Necromancy talks and affects spiritual beings (defeated or not) and can embed their power into bodies revived through Necromaturgy. The number of undead under control depends on the hero spell power, given there’s no specific population limit in Necropolis when it comes to the undead. Revived troops rot away as days passes by. After a while, they’ll completely turn into regular lower-tier Necropolis troops. Given the undead do not cost population, their numbers are tied with the Necromancer’s powers and skills, distance and weekly marginal neutral deaths. Necropolis has caravan-like ability which sends away some corpse-finders to supply the kingdom demands on troops. Neutral villages or different races may be scattered on areas and they can trade with the kingdom. Diplomacy and maintenance of the area plays a role on how these trades affect. Some NPCs and/or Followers may be found at these locations. Animation works in a similar way than both Necromaturgy and Necromancy. However, it’s not about using dead bodies or spirits, but inanimate Constructs which are given artificial life and will act accordingly to their master’s bidding. They also do no cost population, but they’ll drain the caster’s powers to maintain their numbers and their tier. Constructs can be repaired, if they are damaged. If destroyed, they can repaired, but they need to be reanimated after that – a longer and costy process. Differently from the Undead, which if discarded will cease to exist by rotting away, Constructs which will not be used anymore are sent back to the nearest town and can be either recycled for resources or stored for future Animation. Towns with constructs in their line ups have warehouses to store them. Donations and Sponsorship for buildings, NPCs, brotherhoods, these things can provide bonuses to the kingdom globally, sometimes affecting units or technologies for everyone on the map. Battles are not isolated from external factors. Climate on the Adventure Map will show how climate will appear in battle. So spells cast on the adventure map which influences weather and terrain will also affect battles which take place on enchanted grounds. Adventure Map objects can also influence battles directly or remotely. A Watch Tower, for example, may strike foes every couple of turns if a battle takes place next to it. War assets and supplies are considered Upkeep features. The far a hero carries an army away from controlled territory, the less support and supplies one will get. Armies will get restless, weak, stop healing, reinforcements will not be available, neither will be caravans. The same idea applies when there’s a surplus of armies, which cannot be sustained (even on controlled areas). With that information, there’s a week limitation where armies can sustain unfavorable situation. When that time lapse is gone, surplus troops will leave ranks, retreat back to towns, or simply go rogue. Meanwhile, armies that are not granted supply get lower morale, constant weakness state, lower loyalty and even random losses. Dungeons can only be visited and cleared by a hero alone. When in this mode, the game will assume a First-Person situation (like in Might & Magic) where battles happen in turns, while exploration happens freely. Some dungeons may be hidden from most heroes, and only the skilled ones may find access, or be able to. Dungeons have their own quests, dangers, rewards, NPCs and challenges. Heroes classified as Explorers are better suited for Dungeons. When the hero enters a dungeon, there’s a time in which armies will stay outside waiting. After that time passes, they’ll head to the nearest controlled garrison. Heroes cannot enter a dungeon when there’s not any controlled garrison under their command, because, in a sense, they cannot risk losing their lives or losing their armies in favor simply to explore a dungeon. Some factions have towns equipped with their particular dungeons, their own training grounds. Heroes can tag in duos, always one Might and one Magic. However, the secondary hero will always not be present on the battlefield, and will have a support role based on skills, perks or spells, in a remote assistance. Aside the benefits of having additional support in battle, when the army is defeated (and the main hero is made prisoner, killed, bribed or else, the secondary hero will flee and return to the nearest controlled garrison; only very few exceptions may influence and hinder the secondary hero, including the presence of a secondary hero on the enemy side). Secondary heroes earn a third of experience gained from the main hero when troops are concerned, but gain full experience for their own actions. Secondary heroes are also best suited to fill in the gaps in expertise of main heroes. They can also be used as convoys to require reinforcements and other diplomatic traits. Acting as convoys also help guarantee the effectiveness of reinforcements, given some enemy heroes might have perks and abilities which grants them direct attacks against convoys leaving secretly enemy ranks. So, there’s also a chance that secondary heroes can enter a first-person M&M battle. Luck is a global entity and affects most aspects related to chance in game. Only very specific units may have any sort of influence on luck, and even that has a limited reach as well. Morale and Loyalty are elements which tend to make relationship between heroes, factions and troops. Whilst Morale affects battles the more, Loyalty affects diplomacy within the reaches of the kingdom, from battles to areas under control, local population, town growth, etc. Low Morale doesn’t indicate strictly low Loyalty, but unchecked low morale may lead to disloyalty after a while. The advantage of the undead and mindless controlled units is that their loyalty never wavers, such they also have no morale or mind to think. Upgrades are evolutionary perks. Creatures cannot be downgraded. It’s also something uncommon; some units have it, others don’t. Heroes have armory caravans which they can carry around with their troops, filling a slot similar to slots of spell book and siege weapons; in a sense they remind ammo cart, which is a part of an armory caravan. Armory caravans can carry equipment used by troops, boosting some of their attributes in battle or giving them any sort of edge. 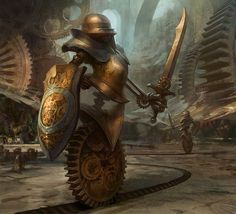 Technologies and equipment are developed in town, and then they are produced, delivered and carried by heroes during their quests. But heroes must also be careful and wary of carrying such things around. If they are defeated, their armory can become spoil of war. Town surroundings may affect it dynamically, even influencing which buildings might or might not be built at certain conditions. A new town can be funded, but it cannot be at the same area of control of any other town. It also costs a LOT of resources, requires a Ruler Hero fairly skilled in Leadership, Historian and Engineering and takes a lot of time to be finished. If enemy forces invade, they can even take the building site, kill or imprison the engineer and convert the town for their own purposes. Town structures can have different placement sites on town design. That depends on the surroundings which also employ different combination of buildings, for alternated approaches of development. These variable sites may provide slightly distinct effects on the building. For example, if the town has a Lookout Tower in their design, placing that tower on high ground will provide better view radius than placing that tower on lower ground. Defensive buildings are usually the most flexible in terms of placement. Ruler Heroes skilled in Engineering, amongst other traits, are much better suited to find other sites and uses for building placement. Town structures can be targeted during sieges, but only after all defensive buildings and siege machines are destroyed. Some castellans may have defensive spells or abilities that also provide additional protection. Castellans are units that are singled out of troops to keep towns safe while heroes are away. They remain in town and can be trained to evolve perks of rule and command. When heroes are visiting a town and they get attacked, castellans will join in their ranks (the same kind of units they derived from) and their addition will give a huge boost to their overall stats. The castellan is the last unit to perish in their stack when it’s attacked. Killing a castellan also provides greater experience and spoils, boost of morale, in shock with a fair drop of morale from opposing forces. Only one castellan may be assigned for each town. They can be relieved of duty at any moment. In a sense, they are not a unit, because they don’t subtract from the stack they are singled out, nor they are added back to the ranks when they are relieved of duty. Spells work around proficiency, which means the more they are cast, the more they will be improved, less charging time, less recovery time, less mana consumption or some other improvements; until they are fully mastered (when a hero will not forget the spell and can cast it even without a book). Spell Scroll can be used by any hero. They’ll cast the written spell and the scroll will be consumed by its own magic. Magic heroes can alter the nature of the written spell to their own knowledge. They can also learn the spell if they consume enough scrolls. 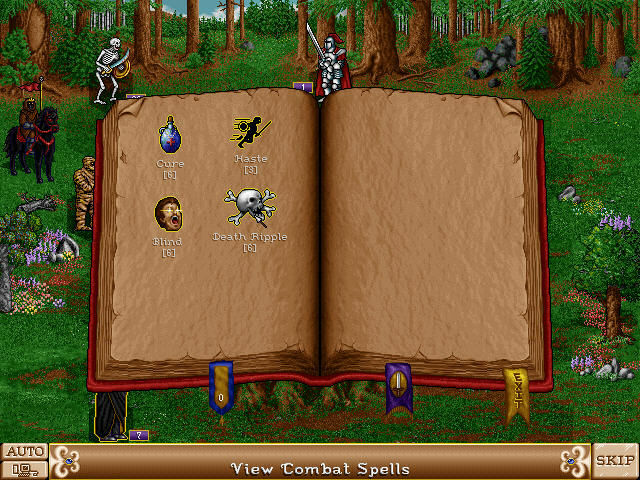 Spell book is used by any hero, but Magic heroes have one since the moment they are hired. Spell books are where heroes write the spells they have learned and their own notes on how to perform and improve those same spells. Spell books are a very important war asset, and they can be even taken as spoils of war. Without their books, heroes can have their spells lose gradually power and even forget spells if they are not cast from time to time. Spell book grant that gradual proficiency improvement to all spells, whilst no decremented by no usage of any spells. When proficiency reaches its maximum rank, the hero is able to produce scrolls of that spell and even teach it in local guilds, where other heroes can learn from. Mastered Spells have great effects when a hero has a spell book, but the main difference is when a hero has lost or has not the spell book anymore. Mastered Spells can’t be forgotten, but they cannot be directly chosen. 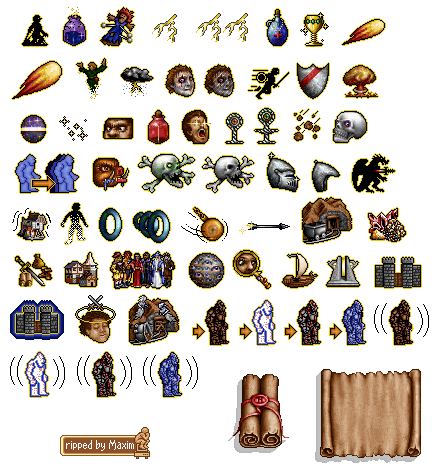 The hero will have mastered spells assorted by effects and also based on memory of situations in which they were mostly used. Upon choosing spell casting actions, the hero will select one of the memorized spells best suited for the situation based on some guidelines (these are the ones that can be chosen instead): offensive, defensive, etc. This balance between choosing or not choosing is another point that makes it so important not losing the Spell Book. 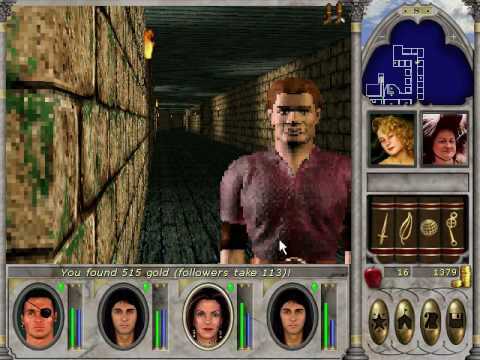 NPCs can assign quests and have a great number of interactions. They are usually immortal, unless if the result of some sort of quest or Campaign requires them to be dead or kills them. Followers work in a similar way they worked in M&M, they’ll provide some sort of bonus to the hero or their troops in exchange of some sort of payment. Some followers can also be assigned to towns, where their talents may uphold a better use. However, followers are heavily affected by Loyalty, and may betray or leave their position, if they don’t feel like following the hero anymore. Some can also be spies. Followers can be killed, if a hero is defeated and the enemy hero chooses not to leave anyone alive. They can also be killed if the town they were assigned to is taken, and their loyalty is too high to allow them working for the enemy. There is a day-night cycle. In fact, on the adventure map, each turn corresponds to one cycle. However, each faction has its own perks on day and night, and may have better performance on battles, exploration, rules, etc. during their respective moment. Mounts have perks as in Age of Wonders. They are present while the hero is wandering the adventure map and during battles, even when a hero is dueling alone enemy forces. Mounts are left outside dungeons though. Flying around the Adventure map is only possible if all units in the army can fly. And even then, they need to finish their movement on solid ground. Besides, weather effects can block access to fliers or even harm them, when it’s hazardous. A last standing hero without a home will starve or die in one week. When a last town falls, the enemy can claim all conquered riches, because the defeated one will have no place to store all resources. Besides losing the town and home, the defeated lose all resources. That’s why it’s so important not allowing that to happen and if it’s imminent, that all resources are spent or dealt with not to give the enemy too much advantage. That’s also why heroes can bury treasures or build treasury rooms within their domains, hidden for safety. However, some heroes, especially Explorers, have keen eyes to spot hidden elements on the Adventure Map, and may find these treasures. There are also banks controlled by NPCs, which can help with savings. The black market can offer almost anything. Things lost in battles against the world or not taken by other kingdoms may resurface in the black market. It can also offer unique elements, technologies, equipment, artifacts, which would not appear on the map by any other mean. Black market cannot be controlled, flagged or bribed. It’s not stationary either. Reinforcements are allowed only when they are within one day or two away from the battle. Depending on the distance they’ll take longer to arrive if they are enlisted. A convoy will be sent to bring reinforcements. Some skilled heroes can have the enemy’s convoy killed, making it impossible for them to get reinforcements. Secondary heroes may act as convoys. Wild Life can affect Adventure Map and Battles. Every action taken provides experience. Heroes tend to gain more experience bonuses from actions related to their main role. When a hero acts with troops, he/she won’t be able to enact orders to the remaining troops. So they’ll act based on the most common order given to them in that situation. Hero gains renown. They will not change classes or anything, but they’ll start having added titles to their names. These stats give them bonuses on interactive elements on the world, while in power, they rely solely on their own. Heroes with high renown grant stronger loyalty. The highest level of renown grants a hero the title of Legendary, which unlocks all perks related to that renown, both in the skill tree, spell casting, exploring of the adventure map, ruling, etc. Last edited by Panda Tar on Nov 23 2018, 17:04, edited 6 times in total. Panda Tar, I've posted a lot of my ideas in other threads that have gotten minimal response. You could look at them to see if there are ideas you'd like. (and many more threads beside). However at this point I'm just tired. Not just because I wrote so much, but because I know that this game is practically dead. By the time a good Heroes game comes out, I would be 50 and no longer gaming. In a way, talking with you is like talking to a vacuum. Not any fault on you and me, but because we know that Ubisoft will never make a good game, odds of a kickstarter are very low, and Vivendi is a long way from doing anything. When I saw that you wanted your hero on the battlefield and to be killable, I stopped reading. No offence. I loved Heroes IV. I personally think having a hero on the battlefield makes sense. But 70-80% of the Heroes community hates or will not play Heroes IV. Having a killable hero is a nonstarter for any kickstarter or fanmod. You won't be able to get volunteers to do the coding, artwork, storyboards etc. Only way your killable hero works, is if Vivendi makes Heroes VIII like that, it turns out to be a good game, and everyone else who hated Heroes IV decides to give it a try thanks to fantastic reviews. I've read your posts in the Some ideas on 3D in Heroes that I hope modders will take up on thread. I actually carried over that post to HC, which is a bit more active, to see how people would respond. Most of them were against the upkeep feel of it. Some stated that Heroes is not a War Game, and also that these things would hinder the fast pace of the game. I think that the 'upkeep' thing can exist symbolically, considering the feedback people gave when they considered impact on economy. But also, the fact that you feel the need of upkeep, also brings up the need of limitations, exactly to stop the matter of infinite growth and infinite numbers and stacking and stacking, giving away the feeling of a late game where only big numbers count. Also most of them disliked the idea of too 'realistic' approach. What I gathered from your posts in general, is that they felt like a mixture of Stronghold with Age of Wonders with Magic sauce. 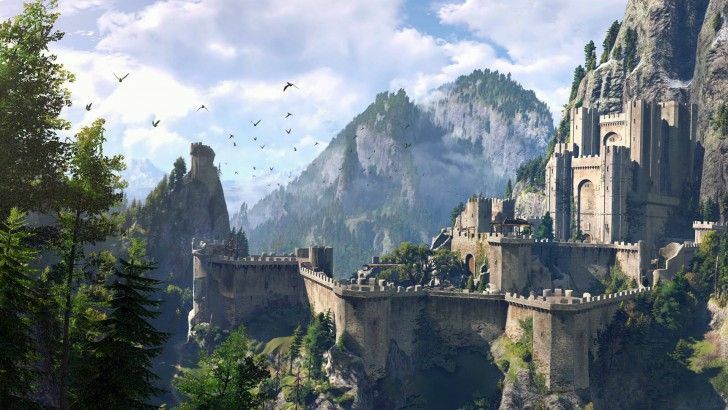 Do you remember Stronghold? That real-time strategy game? It had some realistic considerations, such as food consuming, you had to breed horses, forge armors, provide some detailed things to actually build your town and your army. It was fun. But it was a very different game than Age of Empires, which was, aside from some accurate historical matter, much less realistic and much more fast paces, and I reckon the latter was also pretty much popular. Two games that I own currently are Age of Wonders 3 and Eternal Legends. Both games have upkeep issues and considerations, but Age of Wonders doesn't have stacks. Eternal Legends has seasons, also has things on economics regarding keeping your army (the game is a bit complex so far, and I haven't played too long), and your can actually fight on the adventure map (even skip between fighting and moving other troops on the map during battle, for that I gather you can reinforce them; whilst in AoW 3, you can multiclash a single target). So I don't know if you played any of those, but I gather they might appease your likeness if you want to take a look and see for yourself. As for this thread and about heroes on the battle, this was merely a discussion which started issuing at HC. The most undesired thing about heroes on battlefield was the feeling of unbalance it game in later game, when heroes could take down armies by themselves, and that's what we are trying to discuss to balance that. When I bought H5, I was most disappointed that they cut off the heroes from battlefield, instead of improving the system, the same goes for the nice Hero Class system which also only needed tweaks. But again, that's just me and yes, it feels like talking into the void, because we are most likely never going to see things like that, but here we are. I think H4 was mostly ignored because it was too bold and too unbalanced and prone to death due 3DO going bankrupt. What I was expecting in H5 were those things which felt bad in h4 fixed, not cut. The game felt like a complete halt at improvements, something that felt like they wanted a 3D Heroes 3. That was when I started losing interest in the series. H6 also had bold moves, but was too bad executed (somehow akin to H4), and again, some stuff was completely cut from H7, instead of polished. But that's that, not all majority of fans like the game as it is or how it would be, and in all installments I deeply disliked something, but it wasn't enough to put the game away. What put me away was the disguised stagnant approach which happened since H5 (not saying that ToE and 5.5 is bad, because these are great innovative tools), and mainly because they tried to please everyone not knowing/sensing how to do it. I like talking to you so I will continue, but really, am tired of the entire Heroes idea that’s why I am likely to stop all Heroes gaming. Right now I have no Heroes game on any of my computers. I have lost enthusiasm for this forum and all related forums, also for the same reason as what you said in paragraph 3 of your reply – people in this community don’t like realism in their gaming. I am not asking for nitty gritty realism. The US kept a list of essential commodities for war in WW2, and there were hundreds of names. Now the list is probably thousands, including all the rare earths for instance. There are dozens of these xyz-weird-latin-name-iums. Obviously this kind of realism would slow the game down too much. 7 resources is enough for a complex game. What I greatly prefer, is a Warcraft3 kind of moderation. To stop infinite logarithmic growth and make armies fit within the expectations of proper control. Warcraft3 was too limited, so you were stuck at a limit of 100 food. If you had one hero and 11 resource gatherers, that left you with a max of 12 fighting creatures (if you went the Death Knight+ Frost Wyrm combo). That I found extremely limiting. I believe armies can grow. But also bear in mind that armies cannot grow infinitely because the upkeep and their maintenance start to become so great, that you can no longer ignore them. There is always unrealism to all gaming, but after some point the law of gravity is so great that I can no longer ignore the unrealism and that was when I lost interest in Heroes of Might and Magic. I do like some of the ideas you delineated above. A hero’s aura should have a limited number of squares for instance. If hero is leading 10000 units he can’t be realistically expected to have some kind of aura that protects 10000 units. That’s really pushing suspension of disbelief too far. Feel very annoyed that people will think my suggestions are not fast paced. Taxes, generation limits, logistics for supply – they can all function in the background and do not change your pace. It is obvious that people have seized on one of many points I made, and focused too much on it without nuanced consideration or even properly reading what I said. Since when did I ask for micromanagement of resources? If I loved micromanagement, I would be waxing lyrical on a Civ6 forum. Warcraft3 is a much, much faster game than HOMM, and it has far better and more intelligently considered limitations. Food has limit and requires farms to be built. There are taxes. Hero auras have limited range. Magic has limited range. Attack types work differently on different creatures eg only chaos attacks can penetrate divine armour. Ultimate skills have cooldowns. Units take a certain time to produce and research. Shops take time to restock potions. Units don’t perform so well at night. Slope matters. I would rather have a lot more intelligence in the game (such as battleground considerations) rather than have homogenously dumb chessboard battlegrounds all of which function in the same way without consideration of gradient, soil type, wind direction, time of year, direction of sun, etc. I would rather my hero focused on managing his 10 dragons, 30 casters and 100 archers intelligently, than accumulate an army of 1000 dragons to accomplish the same task. I would rather have a moderately sized intelligent force moving around a desert or mountain, than have endless massive stacks thrown into the grinder. Blizzard’s 100-food limitation for Warcraft and 200-food limitation for Starcraft is very limiting and could be dispensed with for Heroes, but ultimately there should be some restraints. This mathematical expansion to infinity grates on my nerves. I got really sick of it when playing Heroes mod 5.5 where everything turns into legions after a few months, and numbers can no longer be properly represented because the game reports all numbers above 1k as Legion even though fighting 1000 enemies is very different from fighting 32000 enemies. When your armies are dishing out damage to kill 500 or 1000 units per attack, it becomes hard to calculate anything and most spells are a big joke. That’s why I have become alienated from the community. I just don’t like the same things that most people like. I got sick of the Heroes 5.5 mod which basically has only 1 way to increase the challenge – by mindlessly expanding stack size. H5.5 really made it obvious – that I am pretty much explored everything there is to explore about this game and the only challenge left is sheer numbers. Lets say we are playing a Heroes of Might and Magic between Hitler and Stalin. Both sides build up in preparation for war and will duel. German industrial capacity was far higher than Soviet capacity, highest in the world in the 1930s, so Hitler builds a million tanks. Stalin has internal purges and internal disasters like the Ukrainian famine, and winds up with 10000 tanks. Even though Germany could have built 1 million tanks, there simply could not have been a battle for Moscow involving 1 million German tanks vs 10000 USSR tanks. Why? 1) Germany had the ability to build a million tanks, but not to refuel them. Even if all oil sellers were willing and able to sell to Germany, to get enough fuel for 1 million tanks would require more oil refining capacity than existed in the entire world in 1930. 2) To supply the tanks with oil as they rumbled across the North European plain, would require a vast number of trucks to be built. I’m estimating 3-5 million trucks. More trucks than existed in the world in 1930. 3) The million tanks would utterly destroy all roads and churn up all fields and wear down all bridges in the USSR before they reached Moscow. Maybe you could bring 10000 tanks to Moscow – but probably 900000 tanks would not even make it past the Pripet Marshes. The 100000 tanks that did, required millions of trees to be cut down to make tracks, and these trees were worn down after a while leaving the entire area deforested and no more functioning tracks for supporting the remaining 900000 tanks. These 3 points illustrate 3 considerations of real war. 1) maintenance and upkeep of troops; 2) the supply lines; 3) the effect on the real world. I do not need the game to reflect every iota of reality. My point is that, if numbers are allowed to balloon to infinity, and if difficulty is premised on creating enemy stacks that balloon to infinity, at some point the unrealism becomes so great that it becomes a joke. Mines crammed with legions of creatures. Small mountain roads blocked by legions. Enemy castles filled to bursting with dragons and big creatures. With small armies, we can just assume that they are kept fed and supplied and don’t have too much of an impact on the natural environment. For instance, it is safe to assume that 50 human sized units in Warcraft3 (corresponding to 100 food typically) can march down a road without turning it to mush. We probably only need 1 wagon pulled by 4 horses to supply these guys with food for a few days. So upkeep and supply lines and infrastructure concerns don’t really matter. You can just ‘assume done’. We can then concentrate on more useful concerns like troop arrangement on terrain, planning direction of attack, wind speed, whatever. When you start accumulating gigantic armies like in Heroes, the strain on credibility gets too big. When 100 cyclopses cross a bridge, it’s very hard to avoid severe wear on the bridge. When 500 Unicorns walk over a path, the road will be worn down and the last few unicorns might be injured. When you have 200 black dragons in your army a week from the nearest castle, keeping them alive would mean thousands of wagons traveling day and night to feed them. I can no longer ignore these considerations. Personally I am very irritated that so many people prefer the artificial chessboard form of battle, or are so hostile to the notion of fights taking place with three dimensional concerns such as gradient and wind. That’s why I’m out. I’ve lost interest. I’m done with this game. Their main reasoning is based on the way, I think, most play the game on a Multiplayer basis, which is relevantly different from how I play Heroes; I like taking my time to do things and evolve each of my heroes and I'm a solo player too. People mentioned that in the game you must spend your resources to be able to build an initial army to be able to creep and farm around as fast as possible. So, in their understanding, changing this layout, because spending resources with upkeep of troops hinder a bit the pace of building a fast-creeping starting party, would make the game slower. Some other seemed to be conflicted with the idea of spending resources in both buildings and upkeep of troops. Although I didn't play W3, only 2, I played Dota 1, back when it was a W3 map. And I play Dota 2. Mechanics in that game are easily convertible to a better battle scenery in which can or could enrich so much a battle layout for Heroes, as you said. Your units have an area of influence, you cannot see uphill properly, you can miss attacks on troops on the hill, you can also see farther when standing uphill, there are different sort of damages, physical, chaotic, pure, magical, HP removal etc. It's not necessary being another game of the same gender to boost up ideas which may bloom into very good features in Heroes. If given means to it, that is. We kept discussing in that thread I mentioned, and I proposed something like this regarding numbers and representation. Of course, this would open another discussion on whether each town has a limit of 'magical souls', which means a limited number of units to be host based on the size of the town, souls also could be simply 'food', but given we are talking about a magical situation here with undead, constructs and other non-living stuff which don't eat (nor have souls, so they must be magical ), towns would have limits of which can be provided. So, conquering new towns provide numbers, and both towns upkeep troops that way. Now, if you have a big troop, and then you lose one of the towns, the results must be considered, but one that wouldn't require much micromanagement is the same one we see in games like Age of Empires. You need housing your troops. If you happen to reach the limit of troops housed, you cannot train more, but magically you can convert them to your cause. However, if they die, you still cannot hire due the limitation. So, in Heroes layout, if you were cut off upkeep by losing one of your towns, you could keep those troops until they got defeated, which meant that you still wouldn't be able to hire if you were above limit. Or troops started deserting after a couple of days without upkeep and supplies. Maurice wrote: But I do realise this may increase turn length by a great deal, as the number of units on the battlefield would increase rather dramatically. I don't think they needed to be deployed in different limited stacks, or else you can just split the stack? I think that whether you want them to be represented on a greater stack, it could spread around a bit, as if being a Large unit stack, allowing stacks to reach higher numbers, but limiting them, nonetheless. Or you could have option to toggle on and off while map making having games with or without stacks limited by size. That would be a scheme showing a small/normal unit stack numbering. As it grows beyond [blue]Horde[/blue] size, it would spread about adjacent spaces, and that would then happen again when it started becoming a legion. Of course, spreading units would require bigger maps, but does open a set interesting features regarding interaction of numbers, and, as I said on the previous post, helps balancing and escalating the power of lower tiers units for being numerous. 1. Spread units can have a bonus, probably varying as I pointed out in the image, on offensive and defensive capabilities over a less numerous non spread stack of units, mainly because it's easier to focus on them and greater are the chances to kill them faster. 2. Given that they are more numerous and more spread out, it's harder to be focused by less numerous units, which would then have less effectiveness on focusing attacks. 3. These bonuses and penalties would translate even greater when the stacks were beyond legion size, where too few numbers would have even more difficulty trying to take down so many enemies (sorting the problem with escalating lower tier units, very numerous, fighting strong tier units, less numerous). 4. But being too numerous won't only be advantageous. Being that dense and spread about would increase the range of units capable of targeting the stack, more are to hit, which brings another interesting possibility. 5. For these spread out stacks, AoE attacks would then inflict greater damage, because they would hit the whole squadron, which must be translated as the capacity of killing many foes on a single strike, so the more are gathered, the more are killed. But again, limiting stacks and considering these numbers would come in handy whether you started thinking on Heroes and not a THE MORE THE MERRIER kind of strategy. Creature growth and other mechanics should be designed in a different way, because endless stacking of units would end up narrowing the usual strategies in game, and I think that Heroes could be much more than that. The effects on the real world is another topic with varied implications on the game, which needed addressing, once the limits of numbers and upkeep were determined. Something that comes to my mind in a first thought is movement penalty when you are going about places without infrastructure to support bigger army logistics. 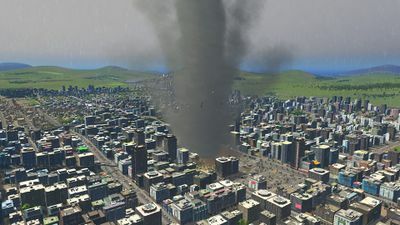 But I gather that these instances might reflect on your Town Management, as to resources you can delegate to keep roads and support buildings running optimal on the Area of Control, which grants you benefits or keeping everything up and running. This setting feels somehow realistic while not time-consuming with too much micromanagement, and also makes late game resources useful, to keep your huge kingdom working properly, and being able to address Areas individually helps in this strategy, whether you can focus on places you are most likely to use. I think if you start simply ignoring certain Areas, they could starting decreasing overall resource production, in a background way to represent dissatisfaction and abandonment, obliging you to poll resources from other places to rebuild. As for the supply, I think the Caravan behavior of previous games could help (free paths between you and your towns), and also considering that those 'magical souls' or 'food' would have different requirements for this and that troop. A peasant needs 1 unit. A Dragon needs 50 units. So it would all depend on the capability of housing of your towns and dwellings (some large units cannot amass too much in a single town). Also, only if towns from adjacent area of control could have blended numbers. Any town isolated would have to go with their own numbers. And, again, limiting the amount of troops a hero can carry around effectively. Nonetheless, whenever you feel like discussing a bit more, I'll be probably around. Although you sound a bit grouch these days, it's always a pleasure. That's almost an idiom. Neverthless it's very pessimistic. For me the current situation means freedom. Yes. Freedom to create new dream and realize it and I bet that in the same manner it's felt byl all modders. Sure I don't have time for, as, practically almost every odd day, I'm working on CH - checkings content and then optimizing menu and so on, because we didn't find any volunteers for. Anyway, let admit it, Ubisoft would never listen to your ideas. Been here, and passed, when H5 was developed, being in the league would eat too much time. But I joined for H6, and was happilly testing. As that I know that this one was promising and I mean it. Sadly, to release it on time, they just cut many features and ideas, also disregarded Quantomas offer to help. Therefore based on my previous experience with H6 I just omitted H7 and only hoped, without my time investment. From my standpoint the game should met two points. Logically there also comes another two. The idea with native hero guards is an intereting one, doable, although complicate. For example on the level of AI I have no idea how to solve it. Hero vs Hero, or similarily Monster vs Monster, sounds like Arena Match. Many points down, some of them were used in different games already, so I see them like an optional. Sometimes less is more. Mechanics must be not too difficult, you must concentrate on some aspects of the game and make them profound, the rest will be supressed. Such the most complete simulator of life is life itself and so it's meaningless to play it, if you can live it. As for upkeeps that's an important change (like many others) with huge impact on gameplay. So, before, by any chance did you played Master of Magic? Last edited by Pol on Nov 11 2016, 23:32, edited 1 time in total. No, it was because Ubi yesterday gave Assassin's Creed 3 for free (it's still avaiable btw) via Uplay and you can guess, what this has done with their servers, which never ever were able to hold much traffic. I was meddling these days a little with Lore. I was thinking on the approach for Necropolis Faction. So I'll post it here not to open another thread. It's a simple resume, some names, but nothing too sowed and complex, mainly a try to get away from the current setting, also trying to detatch the elves from the woodlands for a change. If there's already a setting like that somewhere and I don't know, well, then that's that, hohoho. The oldest of the Enrethas, the elves, immortal beings of beauty and knowledge, are also the loneniest of all, always plunging into the depths of their own sorrow, longing eternal control over what surrounds them, but despair watching the merciless effects of ages gone and ages to come. Their once beautiful and willowy capital city, Thalithas, decayed, corroded by elements, enemies and death, although the elves endured, survived; their allies, though, did not. The fate of the mortal, beloved by the elves started to be questioned by one of the most powerful of the elves of the long gone Enrethas. He was named only Hordinas, a named which then started also to be feared by many other peoples and races accross the vast continent of Levreroth. By using his extensive power over life and creation, blessed as he was, he started interveining with death. At first, allies simply would not die, surviving even against impossible odds, diseases, battles. It was not about healing anymore, old teachings of Garanth, but keeping them alive. Hordinas' sorrow upon not losing the loved, brought him to not allow anyone else to die. However, by breaking the rules of the Enrethas of not interveining on the ultimate rule of the mortal beings, Hordinas lost the powers granted by the primordial Entity Garanth, so his technique, which later came to be widely known as Necromaturgy, could not heal the bodies of his allies, only attach their soul to their dead flesh. From a lonely love, it changed to a fierce, possessive passion, then wrath, convincing himself he was doing the best for his people and allies; and it was not for the lack of support either, because many of them thought Hordinas was right and indeed willing to help them transcend death. But not all were supportive. Hordinas suppressed the free will of mind of the less friendly undead, maintaining a strong grip upon all under his command, walking into an illusion, his eternal fight to find a way to restore the undead into their prime, living form, to control immortality of others. It also led him to a life of murder, because he needed to conserve his beloved allies into their prime force, so he couldn't just wait them age, get old, weak and useless. The council of the Enrethas did not condone his actions and constantly hunted Hordinas, to release the undead and to bestow mortality upon him, but only few of the Enrethas can actually subdue Hordinas, so it's always been a very difficult and dangerous task to be done in which some, weaker, Enrethas have already perished in the attempt, to never be seen again, but rumored not to have really died either. Enrethas: a group of first borns of different ancient races, a similar design of some already known fantasy settings. Garanth: the primordial entity responsible for natural renewal, including life and death. Levreroth: the main and most populated continent. Along with three other smaller continents – Smiasta, Mytakasta and Togrun – compose the world of Assentia. Hordinas and the elves: name is a playful inversion of Sandro, with small tweaks not to be so obvious. He would be the first Necromancer, and an elf. Elves are the great majority of the 'living' Necromancers. In this setting, Elf is the embodiment of Loneliness. Necromaturgy: the technique of binding souls to a body through magic or ancient seals, but it does not grant the renewal natural flow of Garanth, which is why the body decays, even if inhabited by a soul. Hm, meanwhile I'll revise the first post and check what changed in my mind meanwhile. Sorry, Pol. Was that question addressed to me or jclee? I have not played that game. I was just reading this thread again and then went to check the game on GOG. It looks interesting. When it gets a promotional sale, I'll add to my GOG library. Last edited by Panda Tar on Oct 26 2018, 17:31, edited 3 times in total. Wow, Panda Tar, talk about a necropost that I happened to see because I happened by! I visit this site like once every few months now. The main reason being that I want 1) to see if anybody has created his own Heroes VII AI; 2) Ubisoft has sold the franchise to someone who is interested; 3) whether Paul Romero has done some new music lately, which I do want to hear. Anyway, I'm kinda sad how this game has finished 'with a whimper'. But it's been going down for the past 10 years so better that it ends rather than they churn out Heroes VIII as a money grab that wastes our time. Currently I do not game anymore. Absolutely nothing in the market is close enough to Heroes. The world gaming market is now over a billion, mostly on handphone games. 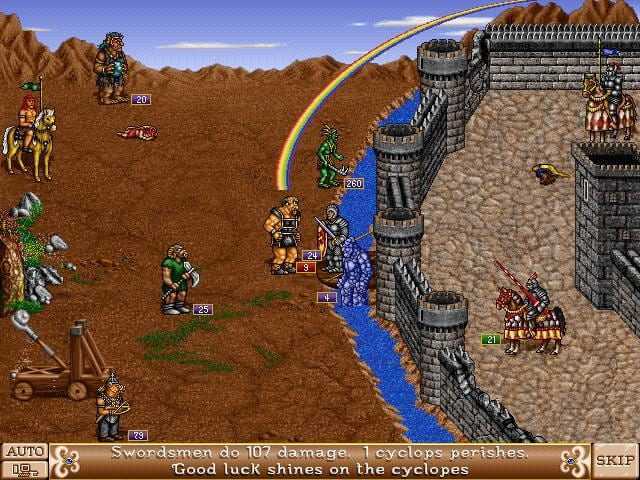 Hundreds of millions play some version of turn based strategy, and hundreds of millions play games with fantasy themes, and scores of millions play on their PCs. I suspect there are millions of potential fans in the market who want turn based strategy-fantasy on PC. Someone who can make the right game can make a lot of money. Unfortunately there is no one willing to do this. Yeah, sometimes I mull over this and that, old stuff. Perhaps I still have some fool's hope, but I really don't sweat it. Whenever I feel like reading or writing stuff on Heroes universe, I do. It's more like cleaning my mind, so to speak. I currently play a couple of games of different genres, as my mood and taste for them changes with time and basically on PC (So I'm one of those who'll be probably waiting forever for something of that genre). After Heroes fiasco in the last years, I also dropped from playing TBS, even tried some, but it looks like my mood swing went somewhere else. Still, I keep an eye on what Quantomas might cook or help someone who might. just read that C&C, Command and Conquer, is scheduled for a remaster. It's a 25 year old game. And they are planning to update it. and old fans like me are keen to buy. Low risk, low development cost, decent profit. These guys at Ubisxxt don't seem to know how to make money by giving fans what they want. There are so many examples of how they are out of touch. But one random example that just popped up in my head because of the Conflux H7 mod in progress, is that of the Phoenix. When I saw that Ubisxxt had made the H6 Firebird/ Phoenix blue-gray coloured, I knew these guys were totally out of touch. Last edited by cjleeagain on Nov 15 2018, 16:01, edited 1 time in total. Yes, I was watching a post-Blizzcon analist talk about that. There was even a link for some CaC games to download as well, the old ones. I was never a fan of CaC, but I would be glad if other publishers emulated on that idea for other franchises and titles as well.